As orders slow, I'm starting a new obsession, crocheting. I have a fondness for it from my Grandmother. She would sit and crochet all the time. When I was born, figuring she wouldn't be around for my wedding... she made me a set of dollies and a tablecloth. Sadly she was right, I was 13 when she passed but I have these lovely memories and amazing work-womanship to forever cherish. 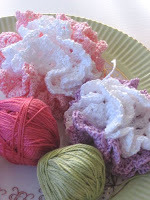 So, I picked up one of her needles and started to make granny squares and that has now led to these flowery puffs. I love the colors. I keep making them, all sizes and a rainbow of colors; now, what to do with them. 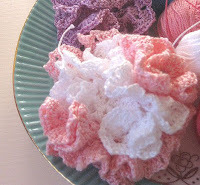 I, originally thought, that I would make them into brooches or decorative flowers to attach to all my fabric pocketbooks. I've developed a thing for all the Vera Bradley line. Thanks a lot Pammie! But now I'm getting crazy with crocheting and keep making them and they are starting to accumulate like bunnies mating!! I did post them on flickr and thanks ittybittybirdie for the great suggestions! Any ideas, I always open for suggestions!